When I was in London on Thursday, I diverted to the National Portrait Gallery for half an hour. What astounds me about the NPG is that it has so many pictures in it that are grade 1 famous. They appear in schoolbooks throughout the land, reproduced in print for generations of young scholars, yet here they are, all in one place, where you could actually touch them if you didn't mind the loss of several years of liberty which would immediately ensue. What's more, you can take photos of them. You didn't used to be able to, on the grounds that flash photography would bleach out the paint pigments; I never bought that argyment myself, though, suspecting that the real reason was so they could sell prints of the paintings in shops. Faced with more people wielding phone cameras than they can possibly stop, though, the gallery now allows photographs of the paintings. It ensures the continued sale of print copies by positioning lights so that if you want that picture of Prince Albert, you're going to get it with green lampshades on his head unless you visit the shop (or, presumably, save the image from the web site). 1) It looks real. I don't mean it's a photo-realistic accurate representation, but it does show what Wilberforce actually looked like. 2) It lays bare the soul of the man. The portrait was said at the time to capture "the intellectual power and winning sweetness", and it really does that. You can read that face, and see it belongs to a thoroughly decent human being. 3) It shows the past was as the present. You can imagine seeing someone looking like that in real life today. People are people; their fashions may change, but their humanity doesn't. 4) I'm a fan of William Wilberforce. OK, so I'm a bit partisan in that we only have one historical figure of international importance who came from my neck of the woods, and that's Wilberforce. Nevertheless, you have to admire what he achieved. 5) I like the symbolism of the fact the painting is unfinished. Wilberforce oversaw the passage of the 1807 Act of Parliament that banned the slave trade, but he died a month before the House of Lords passed into law the 1833 Act that abolished slavery outright. Even that was only throughout most (not all) of the British Empire, but it set in motion similar laws in the rest of the world. 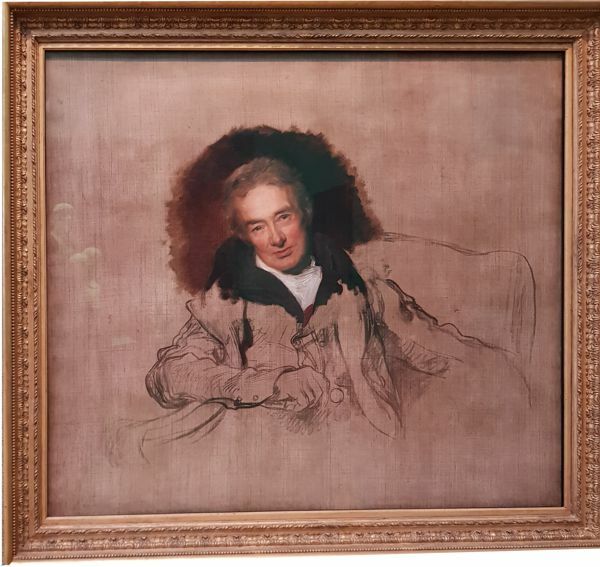 Wilberforce's work, like the painting, was unfinished, but the important part is there. 6) I like Thomas Lawrence as a portrait painter. I don't know what actual artists think of his work, but it impresses me! He did the one of the Duke of Wellington that appears in all the school textbooks, too.